Manipulations of the DNA double helix during replication, transcription and other nucleic acid processing cause a change of DNA topology, which results in torsional stress. This stress is relaxed by DNA topoisomerases, a class of enzymes present in all domains of life. Negatively supercoiled DNA is relaxed by type IA topoisomerases that are widespread in bacteria, archaea and eukaryotes. In Escherichia coli there is conflicting data about viability of ΔtopA cells lacking topoisomerase I. In this study we sought to clarify whether E. coli cells lacking topoisomerase I are viable by using a plasmid-based lethality assay that allowed us to investigate the phenotype of ΔtopA cells without the presence of any compensatory mutations. Our results show that cells lacking topoisomerase I show an extreme growth defect and cannot be cultured without the accumulation of compensatory mutations. This growth defect can be partially suppressed by overexpression of topoisomerase III, the other type IA topoisomerase in E. coli, suggesting that the accumulation of torsional stress is, at least partially, responsible for the lethality of ΔtopA cells. The absence of RNase HI strongly exacerbates the phenotype of cells lacking topoisomerase I, which supports the idea that the processing of RNA:DNA hybrids is vitally important in ΔtopA cells. However, we did not observe suppression of the ΔtopA phenotype by increasing the level of R-loop processing enzymes, such as RNase HI or RecG. Our data show unambiguously that E. coli cells are not viable in the absence of DNA topoisomerase I without the presence of compensatory mutations. Furthermore, our data suggest that the accumulation of R-loops is not the primary reason for the severe growth defect of cells lacking topoisomerase I, which is in contrast to the current literature. Potential reasons for this discrepancy are discussed. Cellular growth and division requires unwinding of millions of base pairs to allow duplication of chromosomes or to produce the RNA transcripts needed to express genes. Unwinding of the double helix results in torsional stress, a stress solved by topoisomerases, a ubiquitous group of enzymes that are capable of managing the topological state of DNA. Topoisomerases transiently break either one (type I topoisomerases) or both strands (type II topoisomerases) of the double helix, change the topological state of the DNA and then re-ligate the break. This manipulation enables not only modification of DNA superhelicity to allow unwinding of the double helix, but allows the decatenation of circular DNAs, thereby enabling circular chromosomes or plasmids to be separated during cell division [1–3]. In Escherichia coli one of the best studied examples of a type IA topoisomerase (where the protein link is to the 5' phosphate, in contrast to type IB topoisomerases where the protein link is to the 3' phosphate) is DNA topoisomerase I, which is encoded by the topA gene. Topoisomerase I relaxes negative torsional stress and is required to prevent the chromosomal DNA from becoming extensively negatively supercoiled . Topoisomerase I requires an exposed single stranded region . In E. coli the chromosomal DNA is normally slightly negatively supercoiled due to the activity of DNA gyrase, a type IIA topoisomerase, and extensive single stranded regions are not available for topoisomerase I to act on . However, the unwinding of the double helix will result not only in single stranded regions but also in extensive changes in the local level of torsional stress. For instance, the "twin-domain" model of transcription suggests that the elongating RNA polymerase complex (RNAP) causes accumulation of positive torsional stress in front of the transcription complex, whereas negative supercoils accumulate behind . While the positive supercoils are relaxed by gyrase, the negative torsional stress leads to the formation of single stranded DNA, which is a hot-spot for relaxation by topoisomerase I . In cells lacking the activity of topoisomerase I the chromosomal DNA becomes hypernegatively supercoiled, especially behind transcribing RNAP complexes. DNA gyrase will remove the positive torsional stress in front of RNAP, whereas the negative supercoils will persist if they cannot be relaxed by Topo I. This accumulation of negative supercoils has been thought to increase the probability that the newly generated transcript will hybridise with the template strand, thereby forming an R-loop . This idea was supported by results showing that R-loops are a substrate for topoisomerase I in vitro . Furthermore, increased levels of RNase HI, encoded by the rnhA gene, have been shown to partially suppress the growth defect of ΔtopA cells, while the deletion of rnhA exacerbated the ΔtopA phenotype . It was initially described that ΔtopA cells can grow without apparent ill effect . However, it was later discovered that the ΔtopA mutant strains used had accumulated compensatory mutations in DNA gyrase and that ΔtopA strains without these suppressor mutations show a severe growth defect , an observation confirmed in later studies . It is not clear why growth of cells lacking topoisomerase I is so severely impeded. The genetic interaction of topA and rnhA has led to the suggestion that R-loops might be a major problem for ΔtopA cells. However, ΔtopA strains have been reported to be viable in Salmonella , a result that prompted Stupina and Wang to re-investigate the viability of E. coli cells lacking topoisomerase I and they reported that viable ΔtopA derivatives can indeed be engineered . In this study we employed a plasmid-based lethality assay [12, 13] to investigate the viability and the phenotypes of ΔtopA cells without the presence of any compensatory mutations. Our data show that cells lacking topoisomerase I suffer from an extreme growth defect and cannot be subcultured unless they acquire compensatory mutations. This growth defect was suppressed by overexpression of topoisomerase III, the other E. coli type IA topoisomerase, as reported [4, 14]. We show that deletion of rnhA strongly exacerbates the phenotype of cells lacking Topo I, which supports the idea that processing RNA:DNA hybrids is vitally important in the absence of topoisomerase I. However, in contrast to previous results  we did not observe any suppression of the ΔtopA phenotype if the level of R-loop processing enzymes (RNase HI, RecG) was increased, suggesting that R-loops are not the primary reason for the lethality of ΔtopA single mutants. To investigate whether a ΔtopA strain can grow without compensatory mutations we employed a plasmid-based lethality assay [12, 13]. The wild type topA gene was cloned into pRC7 (pAST111), a lac + mini-F plasmid that is rapidly lost from cells. This was used to compensate for a topA::apra null mutation in the chromosome of a Δlac background. If a ΔtopA mutant is viable, plasmid-free cells will form white lac - colonies on agar plates supplemented with X-gal and IPTG. However, if a topA deletion is lethal, cells that have lost the plasmid will fail to grow, allowing only formation of blue lac + colonies. When viability is reduced but not eliminated, the colonies formed by cells retaining the plasmid are noticeably larger than those formed by plasmid-free cells [13, 15]. As shown by the absence of large plasmid-free (lac - ) colonies (Figure 1A), ΔtopA::apra cells without topoisomerase I are extremely sick on LB agar. This severe phenotype was only little affected by different temperatures or salt concentrations (Additional file 1: Figure S1A and Additional file 1 S1B) [11, 16, 17]. On minimal medium, white colonies were observed (Figure 1A, panel iv) but they rapidly accumulated suppressor mutations upon re-streaking onto minimal medium (Figure 1B). We repeated the experiment using the ΔtopA75 allele used in the study of Stupina and Wang , which gave identical results (Figure 1C, panel v and vi). Thus, our assay shows that cells lacking DNA topoisomerase I are extremely sick and grow very slowly, but develop suppressors, suggesting that the selective pressure for compensatory mutations such as mutations in gyrA, gyrB, tolC and topB [4, 14, 18] is very high. Many of the studies investigating the properties of ΔtopA cells have worked in a background with a conditional gyrB mutation. Mutations in gyrA or gyrB reduce the global level of supercoiling, thereby enabling ΔtopA cells to grow . In gyrB203(ts) strains the activity of gyrase is reduced at high temperature. Thus, ΔtopA gyrB203(ts) cells grow at high temperature, since the reduced activity of gyrase compensates of the absence of topoisomerase I, but are cold-sensitive . By using the plasmid-based lethality assay we were able to investigate some of the properties of ΔtopA cells without the presence of a compensatory mutation. We repeated overexpression studies with topB, which encodes for topoisomerase III, the other member of the type IA family of topoisomerases in E. coli . DNA topoisomerase III was shown to relax transcription-induced negative supercoiling in vivo and in vitro  and high levels of expression partially suppressed the growth defect of ΔtopA strains . To investigate the effect of topB overexpression in a topA deletion background we used pECR17, a P araBAD topB expression plasmid that allows arabinose-controlled expression of topB. For these experiments cultures were grown overnight, with selection for both pECR17 and pRC7 topA. The cultures were then diluted as described in Material and Methods and parallel cultures grown with the arabinose concentration indicated, selecting only for pECR17. The cultures were then diluted as described and plated on plates with the corresponding arabinose concentration and selection for pECR17. 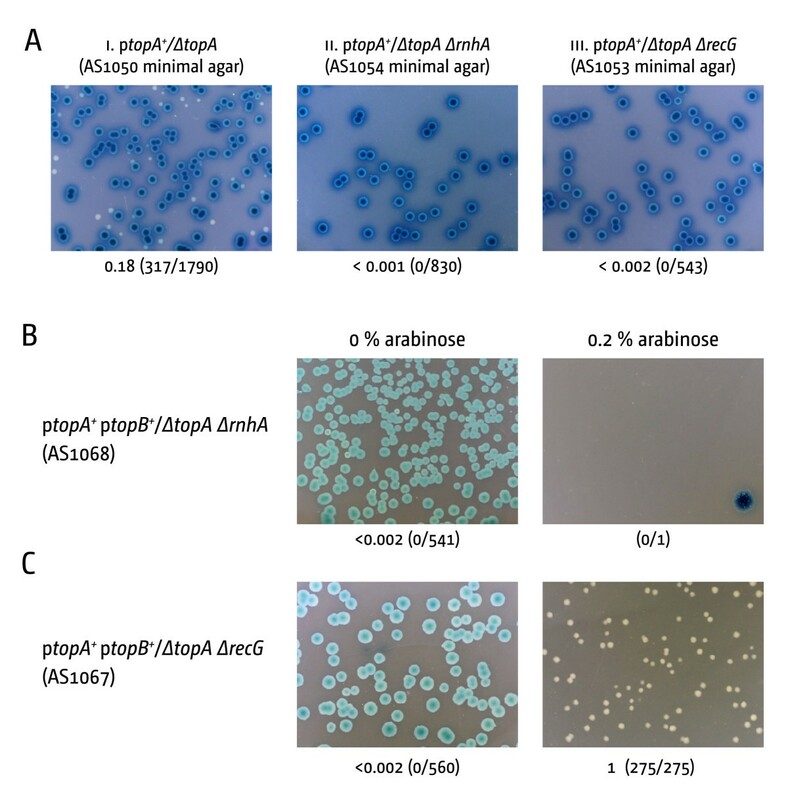 Formation of white colonies was observed if expression from the P araBAD promoter was induced with medium and high levels of arabinose, confirming that topB is a multicopy suppressor of ΔtopA (Figure 2A). The white colonies were smaller in size, suggesting that overexpression of topB suppressed the phenotype of topA cells only partially, as observed before . We also observed a strong decrease in the number of blue colonies with increasing levels of topB expression and the blue colonies showed a rather unusual morphology (enlarged colonies are shown as insets in Figure 2A panel i and ii). It appears that the overexpression of topB prevents growth of cells that retain the topA plasmid, in line with previous results showing that increased levels of topoisomerase III are toxic for E. coli wild type cells [14, 19]. It was previously reported that the growth defect of cells lacking topoisomerase I can be suppressed by increased concentrations of RNase HI. Furthermore, ΔtopA ΔrnhA double mutants were found to be inviable even in the presence of point mutations that strongly suppress the ΔtopA phenotype . This led to the suggestion that RNA:DNA hybrids might be a major problem for ΔtopA cells . We therefore investigated whether RecG helicase suppressed the ΔtopA phenotype. RecG protein was shown to unwind the RNA from R-loops in vitro [20, 21] and overexpression of recG results in reduced yields of ColEI plasmids that initiate replication via an R-loop , suggesting that RecG can process R-loops in vivo. To investigate whether recG overexpression suppresses the ΔtopA phenotype we used an overexpression construct as described for topB (see Material and Methods). The plasmid fully suppressed the phenotype of cells lacking RecG if expression was induced, whereas no suppression was observed under conditions where expression was repressed . As shown in Figure 2B expression of recG at high levels only marginally suppressed the topA phenotype. Our data suggest that R-loop processing activity of RecG is not sufficient to suppress the ΔtopA phenotype efficiently. To confirm that elevated concentrations of RNase HI suppress the growth defect of cells lacking topoisomerase I we repeated the experiment with a P araBAD rnhA plasmid. However, medium expression levels of rnhA from a P araBAD plasmid proved toxic for the cells (Additional file 2: Figure S2), presumably because the high levels of RNase HI degrade the R-loop required to initiate replication at the pMB1 origin. To avoid this problem we amplified the rnhA locus including the arabinose promoter region and integrated the construct into the proB locus, using standard single-step gene replacement . To confirm that expression of the chromosomal rnhA construct can be controlled by arabinose we tested whether it could suppress the synthetic lethality of rnhA recG cells [15, 24]. We generated a rnhA recG proB::rnhA + strain in which the recG deletion was covered by pJJ100 (pRC7 recG + ). As shown in Figure 3A, only very small white colonies were observed after incubation for 48 h on LB agar without arabinose. These white colonies are formed due to the leakiness of the araBAD promoter. 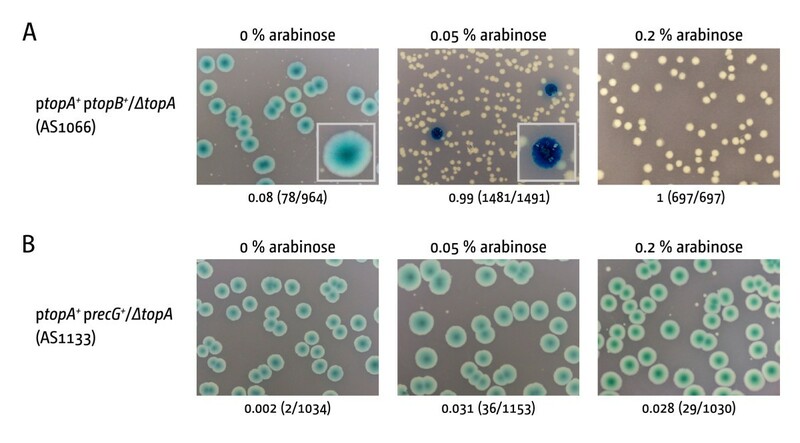 In contrast, on LB agar with moderate arabinose concentrations robust segregation of blue and white colonies was observed, with the white colonies being as healthy as the blue. Thus, expression of the integrated rnhA construct can be regulated by the presence or absence of arabinose. To test whether increased levels of RNase HI can suppress the lethality of topA strains we integrated our proB::rnhA + expression construct into an rnhA + background. Thus, any expression from our integration construct will be in addition to the expression from the native rnhA gene. We then introduced our topA::apra allele, covering the deletion with the pRC7 topA plasmid. However, growth of this strain in medium with moderate (data not shown) or high arabinose concentrations did not lead to formation of white colonies (Figure 3B). Since we did not directly measure the concentration of RNase HI in cells we cannot exclude the possibility that the levels in our expression constructs are not high enough for suppression of the ΔtopA phenotype. We therefore wanted to test the expression of rnhA in a system that might be more sensitive for low expression levels. It was observed before that the co-expression of both rnhA and topB resulted in a synergistic suppression of the topA phenotype . We therefore wanted to know whether the expression of rnhA from our integration construct would increase the suppression of the observed topB overexpression. To test this we transformed our ptopA/ΔtopA ΔproB::rnhA + background with the topB expression plasmid. However, co-expression did not lead to an increase in the size of the white colonies. If anything a mild reduction of viability is observed (Figure 3C). The data presented imply that increasing levels of RNA:DNA processing enzymes appears not to be enough to suppress the phenotype of cells lacking topoisomerase I. Since we used an experimental system that was independent of ΔtopA compensatory mutations there might be a number of reasons for the observed differences. The available topB overexpression data suggest that ΔtopA cells suffer from strong topological defects. It is possible the gyrB203(ts) compensatory mutation alleviated some of these defects even at low temperature, which might enable increased levels of RNase HI to suppress the phenotype even further . Alternatively, the level of RNA:DNA hybrids might be very high. Since we did not measure the expression level of our ΔproB::rnhA + directly, we cannot exclude the possibility that the rnhA expression level is not high enough for suppression of the ΔtopA phenotype. To investigate whether an RNA:DNA hybrid processing activity is important in the absence of Topo I we generated a ΔrnhA ΔtopA double mutant, as it was described before that topA rnhA double mutants are inviable even if topA is suppressed by strong suppressor mutations such as gyrB203(ts) . We noticed that ΔrnhA ΔtopA double mutants were not able to form white colonies on minimal medium, which suggests that the deletion of rnhA indeed exacerbates the topA phenotype (Figure 4A panel ii). We transformed the ptopA/ΔtopA ΔrnhA strain with our P araBAD topB overexpression plasmid to verify that the ΔrnhA ΔtopA double mutant can be partially suppressed by overexpression of topB, as reported . However, overexpression of topB did not suppress the synthetic lethality of ΔrnhA ΔtopA cells in our system (Figure 4B). Cells cannot grow in the absence of the topA plasmid despite the overexpression of topB. However, in cells retaining the topA plasmid the high levels of topoisomerase III is toxic, which explains the almost total absence of colonies (Figure 4B). Thus, the resolution of topological stress does not render ΔtopA viable if the major enzyme that processes DNA:RNA hybrids is absent. Our results show that RecG can not compensate for the absence of RNase HI (Figure 2). However, if RecG processes some R-loops in vivo, the deletion of recG in a ΔtopA background should exacerbate the topA phenotype, as observed with rnhA. This was indeed observed. 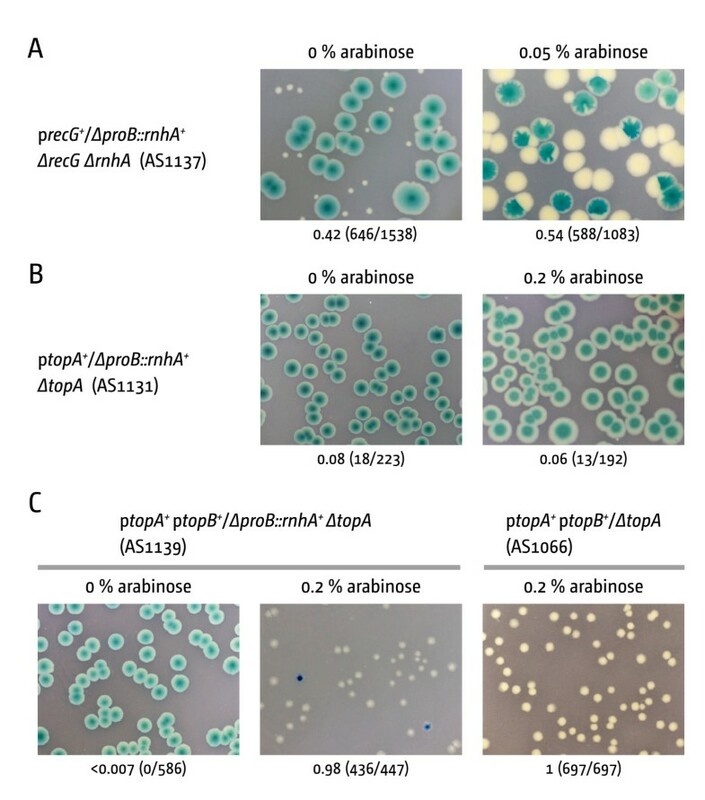 ΔrecG ΔtopA double mutants were not able to form any white colonies, neither on LB broth (data not shown) nor on minimal medium (Figure 4A panel iii). However, when we transformed the construct with the P araBAD topB overexpression plasmid we observed that overexpression of topB allowed growth of ΔrecG ΔtopA cells, with white colonies being only marginally smaller than in the topA/ptopB + control (compare Figures 4C and Figure 2A). Thus, the impact of a recG deletion is marginal in comparison to the impact of deleting rnhA, suggesting that the contribution of RecG to genome-wide processing of R-loops might be lower than anticipated. The plasmid-based lethality assay exploited in this study provided a novel approach to investigate the phenotype of cells lacking topoisomerase I without the presence of any compensatory mutations. The results presented show that cells lacking topoisomerase I exhibit an extreme growth defect, indicating that they are under a constant selection pressure for compensatory mutations. This phenotype was partially suppressed by overexpression of topoisomerase III, suggesting that the accumulation of torsional stress is, to a certain extent, responsible for the lethality of ΔtopA cells, as reported . However, the overexpression of R-loop processing enzymes, such as RNase HI or RecG, did not result in a major suppression of the ΔtopA phenotype. This result suggests that the accumulation of R-loops does not contribute very much towards the growth defect of cells lacking topoisomerase I, which is in contrast to previous reports [4, 7]. However, the absence of RecG and especially RNase HI exacerbates the phenotype of ΔtopA cells, which suggests that the processing of RNA:DNA hybrids is vitally important in the absence of topoisomerase I. Thus, R-loops accumulate to a toxic level only in cells lacking RNase HI, while the toxicity in ΔtopA single mutants is mainly caused by an additional effect that is yet to be characterised. Further experiments will be necessary to shed light on the question as to why cells lacking Topo I have such a severe growth defect and how much R-loops contribute to this phenotype. Bacterial strains are listed in Table 1. All constructs used for synthetic lethality assays are based on E. coli K-12 MG1655 ΔlacIZYA strains carrying derivatives of pRC7 (Bernhardt and de Boer 2004). The deletion allele of topA (ΔtopA::apra) was made using the one-step gene disruption method of Datsenko and Wanner . The ΔtopA::apra allele removes all but 45 bp from the 5' and 3' end of the coding sequence. The proB::P araBAD rnhA was generated by standard single-step gene replacement . pECR15 was cleaved with HindIII and the HindIII frt-kan-frt cassette from pDIM141 (see below) ligated into the construct. The resulting plasmid was used for amplification of P araBAD rnhA frt-kan with the primers introducing 40 bp of sequence homologous to proB. The construct was integrated into the proB locus and the kanamycin resistance marker removed via FLP recombinase . pRC7 is a low copy-number, mini-F derivative of the lac+ construct pFZY1 . pJJ100 (recG + ) and pAST111 (topA + ) are derivatives of pRC7 encoding the wild type genes indicated. The construction of pJJ100 has been described elsewhere [13, 15, 27]. For generation of pAST111 the topA gene was PCR amplified from MG1655 chromosomal DNA. To account for the complex promoter of the topA gene , 150 bp upstream of the start codon were included. Both the 5' and the 3' primer introduced ApaI sites, allowing cloning into the ApaI site within the lacI q gene of pRC7. pAST120 (recG+), pECR15 (rnhA + ) and pECR16/17 (topB + ) are all P araBAD derivatives, which allow arabinose-controlled expression of the genes indicated. For the construction of pAST120 the HindIII fragment from pDIM141 containing a kanamycin resistance marker flanked by FRT sites was cloned into the single HindIII site of pDIM104, the construction of which was described elsewhere . This allowed maintenance of the plasmid via kanamycin selection. pECR15 (rnhA) was constructed by amplifying the rnhA gene from MG1655 chromosomal DNA with the 5' primer introducing a EcoRI and the 3' primer introducing a XbaI site, allowing cloning into P ara B A D . pECR16 (topB) was generated in an analogous way. To allow maintenance of the plasmid via kanamycin the HindIII fragment from pDIM141 was cloned into the single HindIII site of pECR16, analogous as described for pAST120. pDIM141 is a derivative of pLau17 . The eCFP gene was replaced with mRFP (pDIM117). The kanamycin resistance gene was PCR amplified from EZ-Tn10 with primers introducing FRT sites either side, followed by HindIII restriction sites. This FRT-kan-FRT cassette was then cloned into the single HindIII site of pDIM117, resulting in pDIM141. LB broth and 56/2 minimal salts media, and methods for monitoring cell growth and for strain construction by P1vir-mediated transduction have been cited [30–32]. The rationale for synthetic lethality assays has been described [12, 13]. Essentially, a wild type gene of interest is cloned in pRC7, a lac + mini-F plasmid that is rapidly lost, and used to cover a null mutation in the chromosome, in a Δlac background. If the mutant is viable, the plasmid-free cells segregated during culture will form lac - colonies on agar plates. If, however, the deletion is lethal, they will fail to grow and only lac + colonies formed by cells retaining the plasmid will be observed. When viability is reduced but not eliminated, the colonies formed by cells retaining the plasmid are noticeably larger than those formed by plasmid-free cells. To record the phenotype, cultures of strains carrying the relevant pRC7 derivatives were grown overnight in LB broth containing ampicillin to maintain plasmid selection, diluted 80-fold in LB broth and grown without ampicillin selection to an A650 of 0.4 before spreading dilutions on LB agar or 56/2 glucose minimal salts agar supplemented with X-gal and IPTG. Plates were photographed and scored after 48 h (LB agar) or 72 h (56/2 agar) at 37°C, unless stated otherwise. Plasmid-free cells forming small white colonies were re-streaked to see if they could be subcultured, and the streak plates photographed after incubation at 37°C for 24 h to 48 h (LB agar), or 48 h to 72 h (56/2 glucose salts agar), as indicated. We wish to thank Carol Buckman and Lynda Harris for excellent technical help, Tim Moore and Akeel Mahdi for generation of plasmids and some of the mutant alleles exploited, and Amy Upton, Ed Bolt and Peter McGlynn for critical reading of the manuscript. This work was funded by the Medical Research Council (grant G0800970). CJR was also supported by The Leverhulme Trust. CJR and RGL designed the experiments. AS carried out the experiments. AS, RGL and CJR wrote the manuscript. All authors read and approved the final version of the manuscript.